This kit does not include the Crazyradio which can be bought separately. The development platform is open source so schematics and firmware/host source code is available at the Bitcraze website as well as a Wiki with design information and details on how to set up the development environment and get started. It&rsquo;s designed with development in mind and has an expansion header that enables developers to expand the platform as well as good software development support. Due to it&rsquo;s small size it&rsquo;s perfect for developing new software and can easily be flown inside. 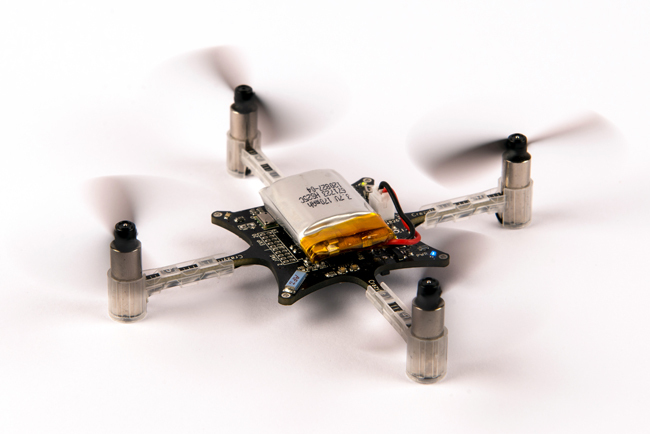 It can lift a payload of up to 5 - 10 g.
The Crazyflie Quadcopter is shipped pre-programmed but can easily be wirelessly updated via a radio bootloader from a host PC, so no JTAG is required for reprogramming. For advanced development and debugging there&rsquo;s also an accessible JTAG interface. If you have any further question for technical support, please contact support@bitcraze.se. For your order 108731,it was refunded by Alipay automatically because of high-risk transaction,please kindly place a new order and change another account to pay,thanks! Do I need to buy separate radios or can I run multiple Quadcopters from a single radio? I have tried to install the driver manually but that still gives me an error that says access denied. what do i do? Please go to our support forum at forum.bitcraze.se and we will help you there.